I joined the Confederation of Democratic Simulators (CDS) in December 2007, when my Avatar was just a few weeks old. I participated actively in CDS until the failure of the merger with Al Andalus in the summer of 2010. At that point I pretty much dropped out of any involvement in CDS, though it took me a while to announce officially my withdrawal from certain functions. In August 2010 I quit CSDF, the political party (or “faction”) within CDS which I had belonged to. But I only resigned from my position on the Scientific Council (the CDS equivalent of a Supreme Court) in April 2011. However, I’m still a voting member of CDS, and my Second Life home is still on the Colonia Nova sim. The time has come for me to assess my experience of virtual democracy in CDS. As explained above, I’m totally out of touch with what has happened there in the past 8 months. I would however be surprised if anything has drastically changed in that time. First, the positive points. The democratic apparatus constructed by CDS seems to me to be essentially authentic. There is clear identification of which avatars are citizens of CDS, based on the verifiable criteria of land ownership. (The only requirement for being a voting citizen is that you must own land in CDS. This is clear in principle, but in practice it can be hard to verify land ownership, as will be explained below.) Every 6 months the citizens vote for elected representatives, via an electronic voting system, on the basis of one vote per citizen. The elected Representative Assembly (RA) then meets regularly (generally every two weeks) in sessions that are open to the public. The RA discusses and votes on legislative measures, including possible constitutional amendments, in a disciplined manner and following clearly established procedures. The elected representatives generally belong to one of the several political parties (“factions”) within CDS (although they are no longer strictly required to have any party affiliation). CDS thus functions as a true multi-party system with authentic government alternation (the process by which one party ousts another, for example in the U.S. when a Republican president replaces a democratic one, or vice-versa). During my participation in CDS politics I’ve witnessed several government alternations. While the dominate political party has generally been CSDF, some notable overthrows were when the governmental majority passed over to NuCare in early 2008 (due it is true to the resignation of several CSDF members in protest over the behavior of their opponents) and the electoral victory of Rose Springvale’s group (which nonetheless refused to recognize itself as a "faction") in the Summer of 2009. Thus the democratic apparatus of CDS would seem to make it truly democratic. But I feel that there are serious short-comings in the way this community actually implements democracy. Before I go on I might observe that something similar can be said of any democratic system: democracy is an ideal which is only approximately approached in any real life situation. The question is whether a given community comes close enough to the democratic ideal to satisfy its members. In the last resort this is an individual judgement. A common defect of supposedly democratic systems is the formation of a Power Elite. This term (coined by sociologist C.Wright Mills in his 1956 book of the same name) refers to a small group of people who control a disproportionate amount of wealth, privilege, or access to decision-making. The Power Elite within CDS is made up of avatars who have more time to devote than others. It is said that time is money, but within communities time is above all power, because influence is exercised by maintaining an active presence. Thus an "inner core" (borrowing the term from Prokofy Neva) has gradually formed over time in CDS. This is a relatively small group of avatars who have intimate knowledge of Second Life, of CDS and of each other, and who generally manage to steer the community in the direction that they want. One could argue that this hidden exercise of power provides CDS with needed stability. CDS is an ungated community, since any avatar in Second Life can become a citizen simply by purchasing land there. As such CDS is susceptible to being taken over by a concerted influx of new residents, which was a fear that I expressed in this post. At the time I was puzzled at how certain pillars of CDS could remain calm when the Representative Assembly fell into the hands of their worrisome enemies the NuCare group. But I gradually realized that NuCare could wreak all the havok they liked in the CDS legislation without ever really putting CDS in danger, because the power elite would always find ways to bring things back under their own control. While it provides a form of stability, however, the unchecked sway of a power elite generally means neglect of the less active members. This is a rule that applies across all social formations. Participation by the rank-and-file never "just happens": it must be actively promoted by providing encouragement, occasions and information. The slow building of a culture of inclusion requires deliberate, focused efforts in this direction over the long run. This perspective is missing in CDS. Another major shortcoming of CDS democracy is the weak control of citizen identity. A basic principle in democracy is that each citizen gets one vote. 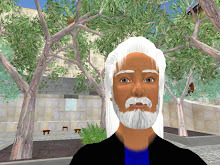 In CDS one avatar gets one vote, but in virtual worlds one real-life person can create several avatars. Each Second Life resident generally has a main identity and then one or more alts. Short of implementing strict identity control, this problem will remain inherent to virtual worlds. However, there are ways to limit the extent of abuse. The main way CDS limits the proliferation of alts is by requiring each citizen to own land in CDS. While the monthly cost of a minimal plot is low, it is a real cost, both in terms of Linden Dollars, and in terms of the effort that must be made to come inworld and visit the payment box once a month. Unfortunately, CDS allows land ownership by informal groups, and then recognizes any member of such a group as a valid citizen. Thus there is no way to directly establish the list of citizens by looking at the list of landowners: one must also contact the representatives of land-owning groups to ask which avatars they count as paying land-owners. This renders the citizen groups opaque and makes it easier to commit voter fraud. The democratic system in CDS thus suffers from definite short-comings. But as I implied above, any real democratic system is going to deviate from the unattainable ideal. It is up to each individual to decide how much democracy they require. I personally have been willing to compromise up until now, in order to participate in an at least partially democratic system. But today I’m becoming more bold in my pursuit of the ideal of participatory democracy. I’ll have to devote a separate post to explaining what I mean by participatory democracy, but I might just say here that it involves taking deliberate steps to help all members of the community to participate more fully, taking into account their personal constraints. The primary constraint holding members back is of course time. If one has unlimited time it is easy to participate in any system. With enough time one’s avatar could serve on the CDS Representative Assembly, participate in the planning and building activities of New Guild, and contribute extensively to the forum and website. But the average citizen who has time constraints finds it difficult just to keep up with CDS news. This was why I tried to offer short summaries of the RA meetings, to help less-active members keep abreast of RA decisions. But of course that project succumbed to my own personal time constraints. I see several possible courses of action for my own pursuit of a more participatory virtual democracy. I could try to push for reform within CDS. That might mean creating a reform party and trying to convince CDS members to support better information sharing and greater participation by all members, rather than just by those who have the most available time. The reform efforts could likewise extend to improvements in the verification of citizen identity. Or I could to try find, or help start, another virtual democracy that would function in a more truly participatory manner. (Wider sharing of power would probably be easier within a community that is at least partially gated, such as by limiting entry to candidates using some sort of reputation system.) But I doubt that I would find the time or energy for such a project. So the most feasible solution for me will probably just be to keep going on as before - now that I’ve had my say. Unfortunately, CDS allows land ownership by informal groups, and then recognizes any member of such a group as a valid citizen. Thus there is no way to directly establish the list of citizens by looking at the list of landowners: one must also contact the representatives of land-owning groups to ask which avatars they count as paying land-owners. This renders the citizen groups opaque and makes it easier to commit voter fraud. The only time this applied was when Al Andalus was part of our membership. Rose Springvale provided the list of current AA citizens in lieu of any other list for voting purposes. The CDS system requires group members wishing to be citizens to pay a portion of their group's tier, with a minimum contribution being L$100/month. As payors, they are assigned a tier payment box and their name is entered into our system. That system can generate a complete list of current citizen names at any time. The only limitation on this is that citizens lose voting rights if they are behind in their tier payments, a factor which the current system cannot track, and which must be kept manually. It is for this reason only that the SC requests a current citizen list before each election. Who are the 'Power Elite' in CDS? Please name names! Sudane - That's interesting: I never realized that each certified citizen gets their own payment box. Still, that minimum contribution of L$100/month is an insignificant amount, and hardly amounts to any real land-ownership. And this setup still allows new members to come out of nowhere just in time for elections, so the problem remains. Patroklus - Heh. I remember one of our citizens who used to put precise names on what he considered to be other people's various logical fallacies. In particular he regularly denounced "ad hominem" attacks. But what do you call it when someone deliberately avoids naming names and getting personal? Hi Danton, I should also note that the cost of becoming a citizen via a group has gone up to $L250.00. Albeit still a small sum. Citizens who were on the roles in this manner were grandfathered at the $L100.00 rate through this current term. Beginning December 2011, all group member citizens will pay $L250.00. I read your post with interest. I must say from my perspective, it always seemed that the people who spent little time in the sims were somehow able to retain control of seats in RA. I think largely this was because many were just trusted long time participants in CDS. Actually my critique of the way CDS works can be applied to any democratic system. All democracies tend to be dominated by an elite, by those that have more time, influence or other advantages. CDS is in fact far more open than most, since anyone with enough time can easily get elected to the Representative Assembly and weigh heavily in decision-making. The point is that deliberate steps are required to minimize the enormous gap between the active minority and the passive majority. Unless such specific steps are taken, the less active members get forgotten.